Our operational excellence provides the foundation for the integrated logistics solutions that we offer to our customers. Having a large team of skilled professionals, we constantly monitor operational performance and service delivery through well-documented SOPs; our quality system is evident by ISO 9001:2008 certification and various national and international accreditations of repute. Our dedicated and experienced teams of professionals are trained to provide tailor-made logistics solutions, customized to particular need, and while being proactive, are always prepared to perform beyond expectations. With a combination of product knowledge and market experience our teams are ever ready to bring you the best services and quality, with cost effective freight solutions. We offer a convenient menu of standard freight management services, but our Ocean Consolidation services are unmatched in the country; where we offer reliable weekly sailings for all major ports of the globe both for inbound and outbound by combining our local strength with global reach through reliable agency network worldwide. 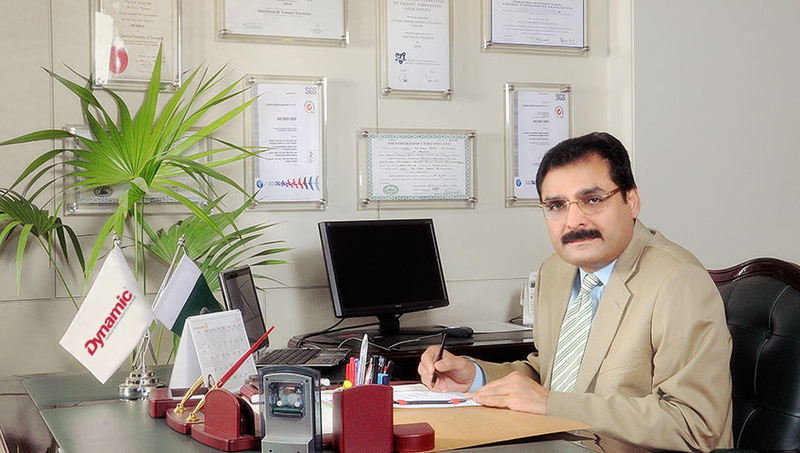 Mr. Tariq Mahmood Chaudhry has vast experience in Shipping & Logistics industry. He started his career, after completing his Masters Degree in Public Administration, as Station Manager Sialkot with GSA / Air France in 1985. Soon he realized that he could get the most out of his abilities and skills by having his own business. As an entrepreneur, he established Dynamic Shipping Agencies in 1995; turning a single entity to a Group of companies with his broad Vision, entrepreneurship ability and strong business acumen within a short span of time. Since then he has been successfully managing his own business, for more than two decades now as Chairman and Chief Executive Officer of Dynamic World Wide Logistics Group (DWWLG). With the passage of time, DWWLG has become one of the leading shipping and logistics groups with three independent functional entities in Pakistan. Aside from this, He has also served as an elected Chairman of Pakistan International Freight Forwarding Association (PIFFA); and a member of Executive committee of Federation of Pakistan Chambers of Commerce and Industry (FPCCI). Still, Mr. Tariq is continuously striving for the development & improvement of Logistics Industry and establishing global links for enhancement of logistics & trade business in Pakistan.